How do you surpass last year’s massive Earth-X crossover event? You introduce a character from the biggest story in DC’s history. The CW just announced that LaMonica Garrett has been cast in the role of the Monitor in this year’s Arrowverse crossover event, which is growing more and more exciting by the day. The Monitor holds considerable significance among DC comics fans, and is one of the cosmic characters at the heart of the universe-shaping miniseries, CRISIS ON INFINITE EARTHS. According to the crossover’s official character description, Garrett will be playing Mar Novu, an extraterrestrial being of infinite power known as the Monitor. The Monitor was created by Marv Wolfman and George Pérez as part of DC Comics’ 50th Anniversary. Mr. Pérez will be illustrating a sketch of the Monitor that plays a prominent role in the crossover’s story. More intriguing still, this news was released along with a new image promoting the upcoming crossover, which is officially titled “Elseworlds” (a name that also holds significant meaning with DC fans). Along with providing a great new logo for the crossover, the image also gives us a look at a new Bat-Signal, most likely for Batwoman. It was announced this summer that the trailblazing Gotham City vigilante will be introduced in the crossover, played by actress Ruby Rose. If Garrett looks familiar to you, there’s good reason. He’s had a long-running career on the small screen, with prominent roles on The Last Ship and Sons of Anarchy. Garrett most recently acting opposite Kiefer Sutherland as his Secret Service officer in Designated Survivor, and will soon be seen alongside Nicolas Cage in the upcoming movie Primal. While Garrett’s a self-professed comic book fan, Mar Novu will actually be his first role in a superhero project. While the Monitor is most associated with Crisis, he actually made his first comic book appearance in 1982’s NEW TEEN TITANS #21, a full three years before CRISIS ON INFINITE EARTHS #1. A cosmic being birthed on the lifeless world of Oa after the creation of the Multiverse, the Monitor holds great power and near-infinite knowledge of the Multiverse. His history is pretty complex, and was made further complicated by 2006’s INFINITE CRISIS and 2008’s FINAL CRISIS. 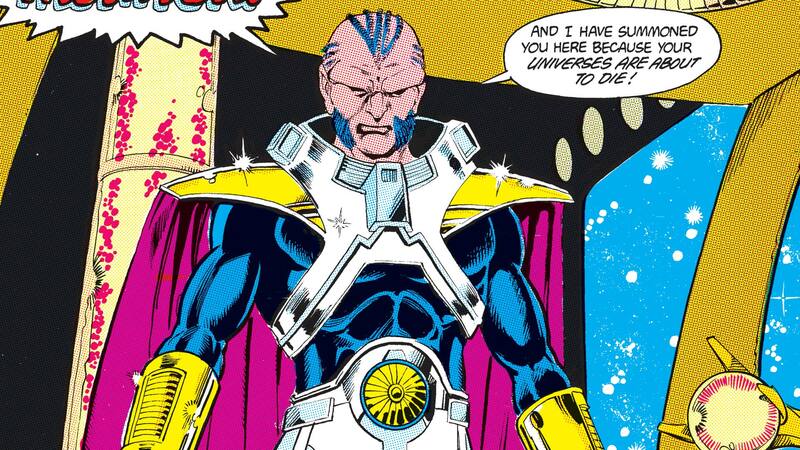 However, his most noteworthy characteristic may be that he has a “twin.” The massively destructive Anti-Monitor was born at the same time as the Monitor, and it was the Anti-Monitor’s attack on the DC Multiverse and the Monitor’s attempts to stop him that form the heart of Wolfman and Pérez’s classic miniseries. This is pretty great news, #DCTV fans! Are you excited to see such an important DC character brought to the screen? And what do you think of that “Elseworlds” title and logo? Let us know all your thoughts down below, and don’t miss the start of the three-episode event on Sunday, December 9th!